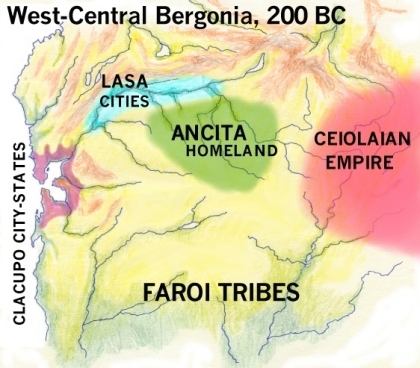 History of Bergonia, Shufrantei Era, 100 B.C. to 1000 A.D. In western Bergonia an Ancita priest named Ierecina founded the Shufrantei religion. He aspired to establish a new state and society as well, in accord with his religion. The entire banda warrior class converted to his way, marched forth enthusiastically at his bidding, and conquered all the cities in Bergonia. The banda caste joined with the newly established Shufrantei priesthood to create a well ordered state. A new orthodoxy emerged, finding energetic expression in great and mature art, including drama, poetry, painting and sculpture. For the first time all Bergonian urban life was united in one culture. This became the "classical age" for all later eras in Berg history. Villages dotted the countryside, and the peasants worked long hard hours under the control of nobles living in manors. Large cities grew, where artisans, manufacturers, traders and slaves lived and worked. Shufrantei temples were everywhere. The Ancita People: As Ierecina rose up to lead all the Ancita to conquer almost all Bergonia, it is useful to understand their culture. The red-skinned Nacateca people inhabited the western half of the Ifuno Plateau. A prominent Nacateca group was the Ancita, a collection of tribal chiefdoms, herders of sheep and goats, and small-scale agriculturalists with a stable village life. There had not yet formed a distinct agricultural class system of peasants and enfiefed noble gentry, to the contrary the surviving literature shows that an egalitarian ethos permeated Ancita society, very much unlike the royalist Lasa city-states. But the Ancita were led by an honor-bound warrior class called the banda, and also by priests and priestesses in service to a pantheon of gods.. They had lived as herders and even hunter-gatherers, but as they conquered the Lasa cities most of them turned to agriculture and grew wheat and beans. The herding and hunting traditions, however, continued for centuries to permeate the culture. A charismatic priest name Ierecina rose up from obscurity in the middle of the Ancita heartland and commenced a reformation of Ancita society. He ordained (a) a system of myths that established a well ordered hierarchy of Gods, (b) a system of rituals related to the sacrament of purification, (c) a calendar to support the system of rituals, (d) a specific philosophy to justify and explain the ritual system, and (f) an organization of priests and an organization of warriors to spread and support the rituals. See Shufrantei Religion. Priests and warriors from all over the heartland turned to him. They hailed him as a prophet whose great holiness attracted a revelation. The Prophet created a strategy called "Subanei"-- the "Campaign," consisting of priests, priestesses and masses of warriors marching forward, singing, cheering, waving flags and ribbons, inviting cities and villages to accept the new way with boisterous preaching. At their first approach to new places they were boastful and festive, but they turned to threats if acceptance wasn't immediately forthcoming. The warriors beat their swords against their shields. If the cities and villages still refused to surrender, the banda warriors attacked. After Ierecina died the "campaign" just went on, expanding the "Prophet's Realm" all throughout western Berg. The Subanei campaign coalesced into a real military offensive when it encountered the armies of the First Ceiolaian Empire. The Ceiolaian army moved in large highly-structured, well armored legions, like the armies of Rome and Persia, while the Subanei banda came in waves of small units, with no armor and light arms, spreading out across the countryside, running, outpacing the Ceiolaian scouts and confusing the Ceiolaian commanders. However once the banda got within fifty miles of Ceiolai they came together into a huge concentration and faced the Imperial Army. One massive battle resulted in the utter destruction of the Ceiolaian army, and the Subanei banda took over the city of Ceiolai as its citizens panicked. This occurred in in 85 B.C.-- a major watershed in Bergonian history. By 20 B.C. every major city in Bergonia had been conquered by the Subanei. Once the conquests ended, the banda tended to settle wherever they took control. The Shufrantei priests who came with them supervised the suppression of the Nine-God worship and all other religions, and they built temples and monasteries to Arkan & Icotesi. After Ierecina died there was an attempt to replace him with a new military and civil leader, who would govern all Shufrantei territory. Ierecina dubbed this post the Naithetieri-- a holy, superior tieri. But Ierecina, for all the other systems he ably constructed, was a bad constitutionalist, and no one knew how to appoint a new leader after the first one died. There were three competing Naithitieri before the whole scheme fell apart, and the banda then reverted back to the form of government they knew before Ierecina-- rule by a dictatorial tieri, a chief in theory elected by an assembly of warriors, but in fact chosen by his predecessor. In the 70% of Bergonia that was now Shufrantei, tieris ruled regional states, supported by banda armies, and rather fanatically dedicated to Shufrantei ideals. The Bergonians adeptly design and construct boxes of wood and wicker for all purposes. In classical times they placed manuscripts and documents in boxes. Boxes of course had compartments as the use dictated. Interior decorating and design accommodated the large number of boxes. The construction of boxes became an art form. Every women had a toiletries box; every sorcerer had a box of charms; every priest and priestess had a worship box containing a copy of scripture, statuettes or figurines of the gods, and the paraphernalia for performing the rite of purification. Every scribe had a writing box, containing ink, blotters, paper and pens, and the box itself served as an impromptu desk, built with a writing surface. Priests serving as physicians carried their medicines, and occupations of all types had their own distinct boxes for storage of the tools of the trade. Warriors boasted that they were "men without boxes."